The terms nanofabrication and nanomanufacturing are often used interchangeably for making one-, two-, or three-dimensional nanostructures in various contexts (medical, photonics, electronics, energy, etc. ), with a relatively high degree of functionality and structural complexity and hierarchy. These terms cover a host of different materials, devices, products, and processes and are simply too broad to cover in detail in a short article. One possible approach to distinguish between the terms is by using the criterion of economic viability: the connotations of industrial scale and profitability associated with the word manufacturing imply that nanomanufacturing is an economic activity with industrial production facilities with more or less fully automated assembly lines. By contrast, nanofabrication is more of a research activity based on developing new materials and processes – it's more a domain of skilled craftsmen and not of mass production. Today, the only industry where nanoscale manufacturing technologies are employed on a large scale is the semiconductor industry, where device structures have reached the single nanometers scale. Of course, the chemical industry has long been working with nanoscale particles and pigments, but this falls more into the realm of chemistry rather than nanomanufacturing. – and using nanotechnology to manufacture nanoscale structures (e.g., dip-pen nanolithography). There are different ways of fabricating functional nanostructures. The two notions you hear most are top-down and bottom-up methods. Michelangelo was a top-down artist. He took one big, raw block of Carrara marble and after years of chiseling away produced a spectacular statue like David. 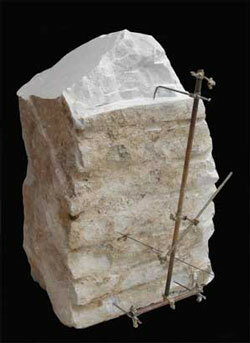 In the process he reduced the original block of marble to half its original volume and left the other half as waste. This is the nanotechnology equivalent of lithography – predominantly photolithography, which is the standard workhorse employed in today's semiconductor industry, and nanoimprint lithography (NIL) for the large-scale production of nanoparticles for diagnostic and therapeutic applications – and other top-down methods where you start by taking a block of material and remove the bits and pieces you don't want until you get the shape and size you do want. In the process you spend (relatively much) energy, use (sometimes very toxic) chemicals, produce (often quite a bit of) waste, need a lot of patience (these processes are relatively slow) and often the results are quite unique and not easily replicable. Marble - before and after Michelangelo's top-down approach. Optical lithography and NIL are the dominant top-down nanomanufacturing methods, although there are a large number of other nanofabrication approaches available. Electron beam lithography (EBL) for instance can generate sub-10 nm features, over large areas, with good placement and overlay, but because of its relatively low throughput, it is limited commercially to the production of masks for use in photo- and nanoimprint lithography and device development. In contrast to the deterministic nature of top-down processes, bottom-up processes are driven by a combination of thermodynamics and kinetics which then determines the yield of the desired structure. Bottom-up nanofabrication processes typically don't need expensive tooling to create nanoscale structures, and scaling to large volumes is potentially straightforward. With the application of the tools of chemical synthesis, quantum dots, plasmonically active particles, carbon nanotubes, metallic nanowires, and multifunctional particles for medical applications have been successfully produced in manufacturing quantities. Efforts to develop purely bottom-up self-assembly methods to create more complex devices typically rely on engineering the interactions between the various components, placing them in a simple environment and then letting the system evolve to a final state. To make things a bit more complicated, there are two fundamentally different ways of fabricating things from the bottom up. And this is where a lot of the confusion about the different nanotechnology terminology comes from. One bottom-up method is nature's way: self-assembly. Self-organizing processes are common throughout nature and involve components from the molecular (e.g. protein folding) to the planetary scale (e.g. weather systems) and even beyond (e.g. galaxies). The other way of doing bottom-up nanotechnology is man's way: molecular assembly. It sounds like self-assembly but it is a very different concept. If you take a look at the nanofactory animation below you'll get the idea. This is the vision that proponents or revolutionary nanotechnology put forward: molecular assembly as a factory concept, assembly lines and all, just scaled down to the nano level. The notion of 'self-assembly' becomes relevant in this context with regard to 'self-replicating' nanomachines, i.e. machines that self-assemble themselves; but this is very different from the type of self-assembly found in nature. There is one – very big – catch though: Today, universal molecular assembly is a vision; in a scientific sense it is not even a theoretical concept yet. The key to using self-assembly as a controlled and directed fabrication process lies in designing the components that are required to self-assemble into desired patterns and functions. 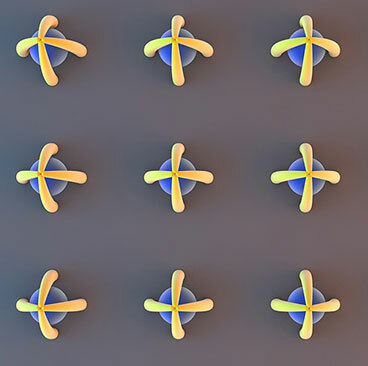 Self-assembly reflects information coded – as shape, surface properties, charge, polarizability, magnetic dipole, mass, etc. – in individual components; these characteristics determine the interactions among them. Unfortunately, spontaneous self-assembly relies heavily on the particles' characteristics. Use different particles, and self-assembly will either form different structures or not occur at all. On a very small scale you wouldn't even use the term self-assembly but rather chemical synthesis – the processes chemists have refined over many years. However, the stability of covalent bonds enables the synthesis of almost arbitrary configurations of only up to 1000 atoms. Larger molecules, molecular aggregates, and forms of organized matter more extensive than molecules cannot be synthesized bond-by-bond. Self-assembly is one strategy for organizing matter on these larger scales. This technique can be summarized as follows: We have no clue why certain atoms and molecules self-assemble the way they do, but once we can initiate and control the process we can use it to build structures from the bottom-up – atom by atom. Self-assembly has become an especially important concept in nanotechnology. As miniaturization reaches the nanoscale, conventional manufacturing technologies fail because it has not been possible yet to build machinery that assembles nanoscale components into functional devices. Until robotic assemblers capable of nanofabrication can be built, self-assembly – together with chemical synthesis – will be the necessary technology to develop for bottom-up fabrication (read: "Mind the gap - nanotechnology robotics vision versus lab reality"). Exploiting nature's self-assembly tricks is real science and it's happening in labs already. As a matter of fact, it's actually about to lead to real world products. A recent example is IBM's announcement of self-assembling structures in their airgap processors. Self-assembly is also the reason why nanotechnologies have such a profound impact on the chemical industry. 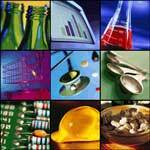 One example is the huge area of polymers used for industrial products (think plastics). Chemists are using molecules' tendency to self-align to design molecular structures with specific properties. Once you know how certain nanoparticles behave and what properties they possess you can use this knowledge to deliberately create structures with desired properties. This is a much more efficient way than the cement mixer chemistry of old where you mix compounds in a more or less arbitrary way based on best guesses and see what materials you get and then try figure out what you could do with them. The two major self-assembly techniques are colloidal self-assembly, which has exciting possibilities in terms of generating novel materials by combining nanoparticles with different properties into well-defined crystalline structures, and DNA, which is the archetypal self-assembling system. DNA-based self-assembly offers flexibility in the types of structures that can be produced, based on single-stranded, double-stranded or duplex, and more complex supra-molecular assemblies. One-, two-, and three-dimensional structures can be made, and the ability of other nanoscale objects to be functionalized with DNA, combined with the specificity conferred by complementary sequence recognition, means that DNA can connect and organize disparate nanostructures to make relatively complex constructs, including well-controlled nanoparticle crystal lattices, and even active systems. Structural DNA nanotechnology, specifically the molecular self-assembly process known as DNA origami, has emerged as a versatile approach to fabricate nanodevices with complex nanoscale geometry, defined placement of molecular functionalities, and programed mechanical and dynamic properties. Scientists already are using DNA origami technology to design and build structures on the scale of viruses and cell organelles. DNA origami is a design technique – similar to the traditional Japanese art or technique of folding paper into decorative or representational forms – that is used by nanotechnology researchers to fold DNA strands into something resembling a programmable pegboard on which different nanocomponents can be attached. These DNA assemblies allow the bottom-up fabrication of complex nanostructures with arbitrary shapes and patterns on a <100 nm scale. Guided or templated self-assembly typically makes use of boundaries created by top-down methods that interact with a system that has an intrinsic structural length scale. This latter can arise from the balance between long-range magnetic, electrostatic, or strain energy, or, as in the case of block copolymers, can come from local interactions built into the molecular structure of the material. The technology to fabricate integrated circuits will continue to evolve in capability and cost, but will remain uneconomic for low value-per-unit-area, high-volume products. The family of lithographic technologies, such as nanoimprint, whose development has been driven in large part by the semiconductor industry, will be scaled to suit a variety of cost structures and so will find a wide range of applications, especially for those structures requiring only a single patterned layer. Bottom-up self-assembly will have a role in the production of simple functional materials that are used in high volumes and must be inexpensive, while directed assembly allows for the imposition of longer-range order and hierarchy that will be important for some applications. Perhaps the most exciting prospect is that of creating dynamical nanoscale systems that are capable of exhibiting much richer structures and functionality. Whether this is achieved by learning how to control and engineer biological systems directly, or by building systems based on the same principles, remains to be seen, but will undoubtedly be disruptive and quite probably revolutionary.